Jackson is a huge fan of chalk. Like, mega-fan. 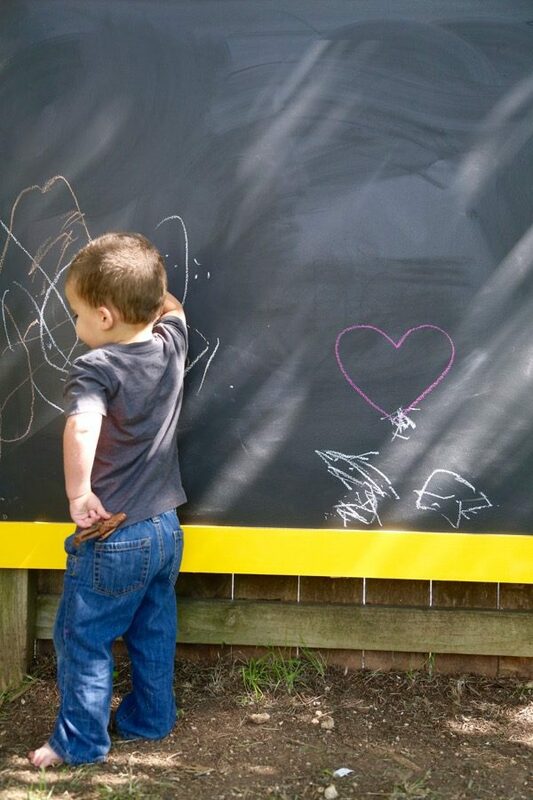 I think he could spend the entire day in the backyard doing nothing but playing with chalk. I love that it’s an activity he enjoys so much, but our backyard patio is pretty tiny, and if we’re using it (which we often are if we’re in the yard), it doesn’t leave much room for him to actually do any drawing. 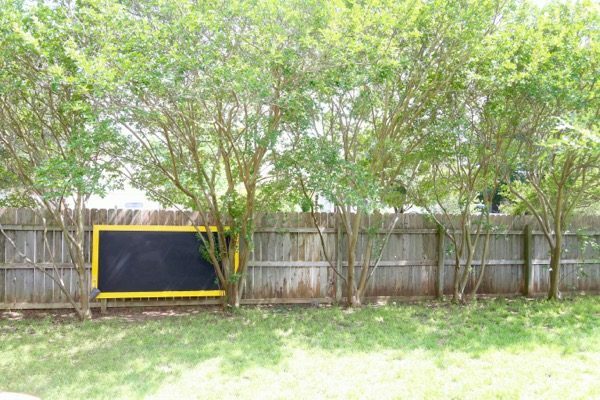 So, when I saw this idea for creating an outdoor chalkboard to hang on your fence, I knew it was something we’d have to tackle for Jackson. And, um, I think he likes it. This project was an easy (and affordable) one, and I’m pretty proud of how it turned out! 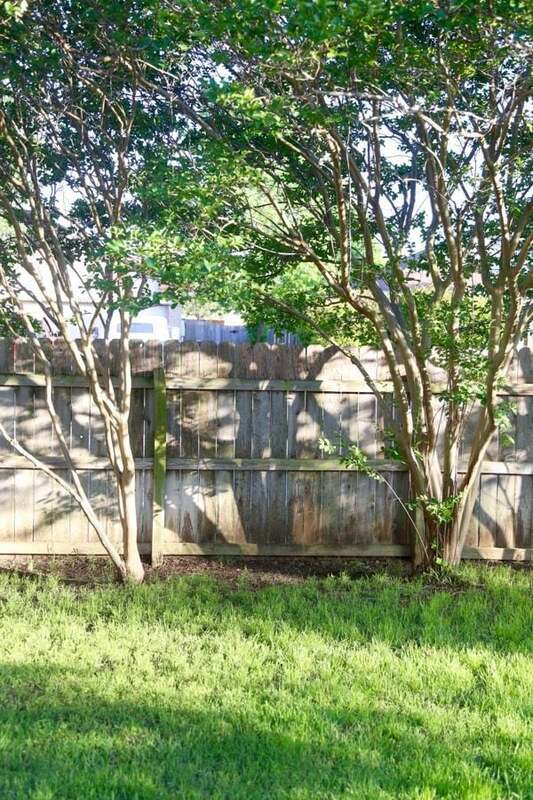 First, we picked a spot – we’ve got an area of the fence that’s nicely lined with trees and gets lots of shade. Jackson already plays over there a lot, so it was perfect! 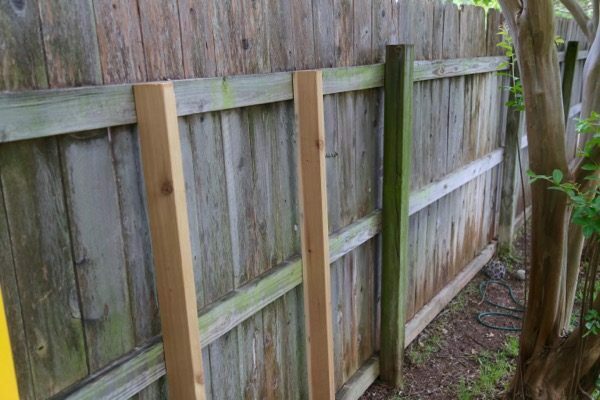 We started with a large 4X8 foot piece of plywood – now, this may be a slightly controversial choice, and we’re fully aware that something like Hardi board would survive the elements better, but we have some old plywood attached to the fence in our backyard that has been there for well over a year and it looks just fine. So, we figured we’d save a little money (and avoid seams, since Hardi board is smaller) and use wood instead of springing for anything else. We did take a few extra measures to keep it safe, though, so keep reading to see how we tried to make sure it’s as weather-proof as possible. We started off with some primer. Lots of it – I did three coats of primer on both sides of the board, and we bought pre-primed boards for the frame. 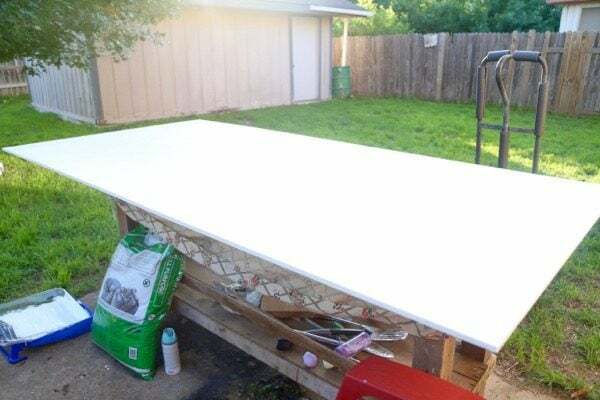 We went ahead and cut the boards for the frame at a 45-degree angle on both sides before priming, then we made sure to get the edges of all the boards particularly well because that’s a place water might seep in. Once it was all primed, it was time to paint. 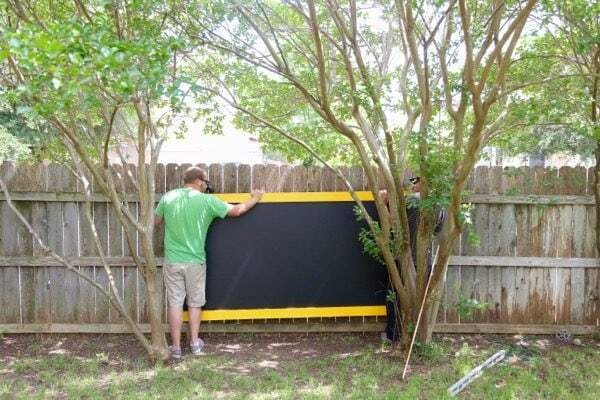 We spray-painted the frame pieces with yellow paint and used chalkboard paint on the big board. 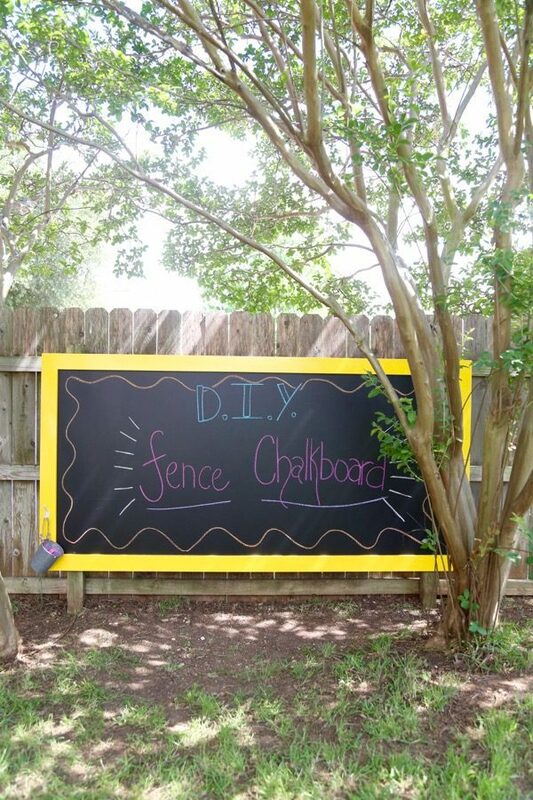 Be sure to check the directions on your paint if you are trying this for yourself – I never realized chalkboard paint requires a full 24 hours between coats! Once everything was painted, it was time to assemble it! Corey flipped the board upside down and clamped the frame boards to it. Once everything was all lined up and exactly where he wanted it, he drilled the frame into the board from the back using 1 1/2″ screws. This way, we don’t have any screws showing on the front of the board! Once that was taken care of, all that was left to do was hang it. We centered the chalkboard on a section of fencing so that each end touches a fence post (there’s a bit of an overhang on each side). He hung some cedar spacer boards in-between the fence posts to ensure maximum sturdiness (they’re the only boards that are exposed and not at all sealed with paint, so we used cedar), then used black screws to attach the board to the posts and the supports (in the black part of the chalkboard, so you can’t see them!). 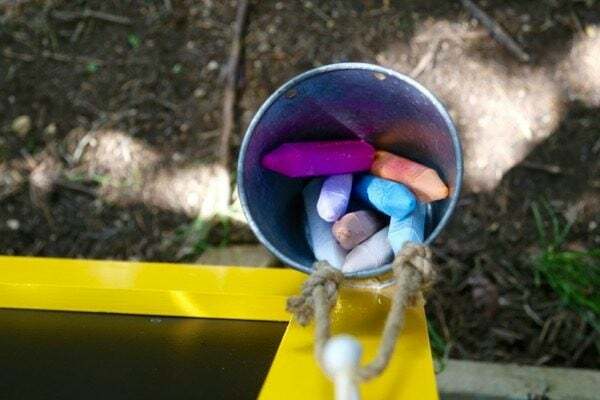 After it was hung, we took a cute little hook from Target and a galvanized metal bucket and hung them nice and low on the chalkboard to hold all of Jackson’s chalk! The bucket is meant for potting, so there’s a small hole in the bottom which will be perfect for allowing water to leak out if it rains. … let’s just say he was excited. Now, like I said in the beginning, this isn’t the most weather-proof option. 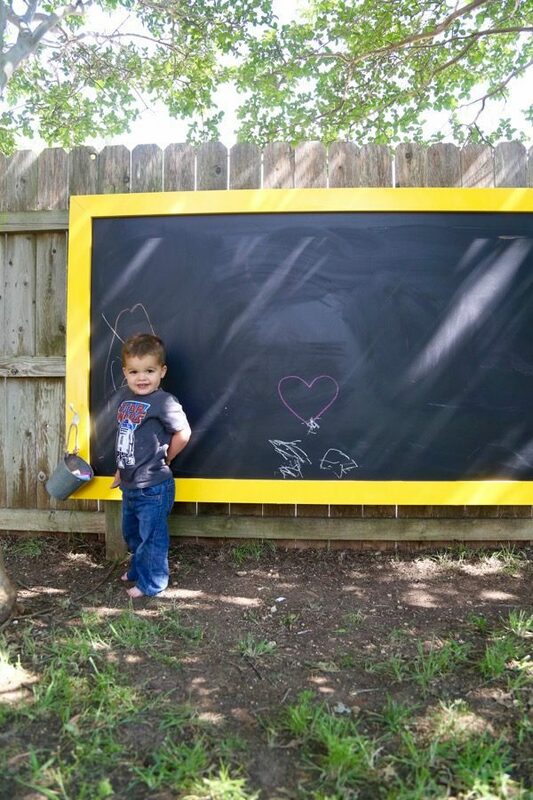 If we wanted to take extra care to keep it safe from the elements, we could have used Hardi board for the chalkboard part and cedar for the frame. However, this is in a pretty well-shaded area that doesn’t tend to get too wet, and we aren’t too stressed about warping thanks to our experience with some other plain ol’ wood being outside for extended periods of time. We’ll keep an eye on it, though, and you know I’ll let you know if we end up regretting this decision! I’m pretty excited to have something fun like this for Jackson in the backyard, and I’m hoping it’s just the first step this summer towards making our backyard a place where we can all really enjoy hanging out. Now if only we could get some dang furniture out here! Update: We finally upgraded our patio a bit, go here to see what it’s looking like now! 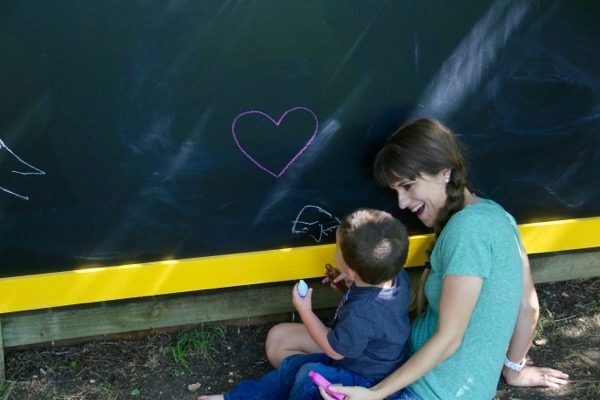 If you love playing with chalkboards, be sure to check out this fun DIY blackboard we made for our garage! 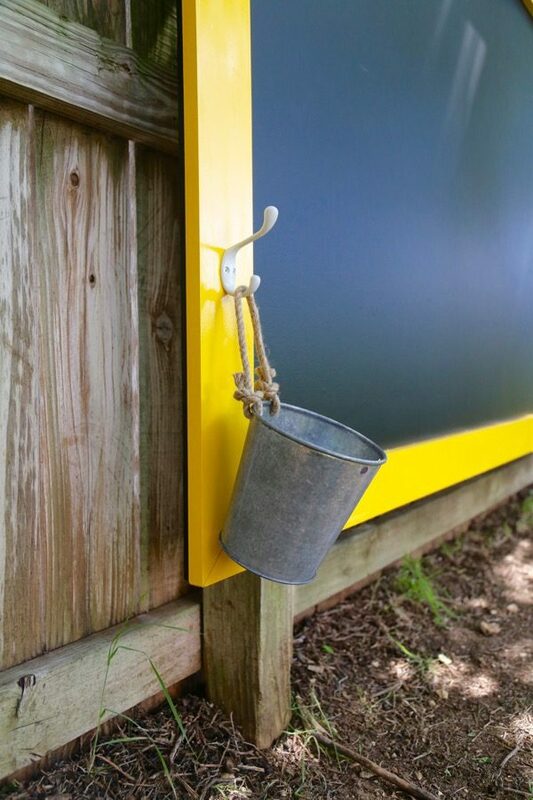 Want even more DIY outdoor project ideas? Check out this post with 15 great ideas! 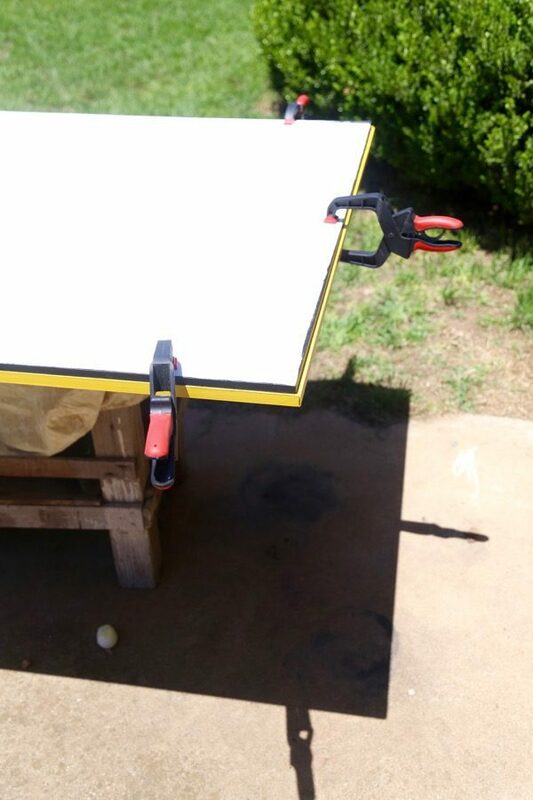 Really cool and simple summer project. Would definitely be taking a shot at this if we had a backyard. Great project! Like one of your commenters said. Perfect for outdoor family games too. I’m thinking as a scoreboard for some family whiffle ball. Oh my gosh Amanda, this is awesome! 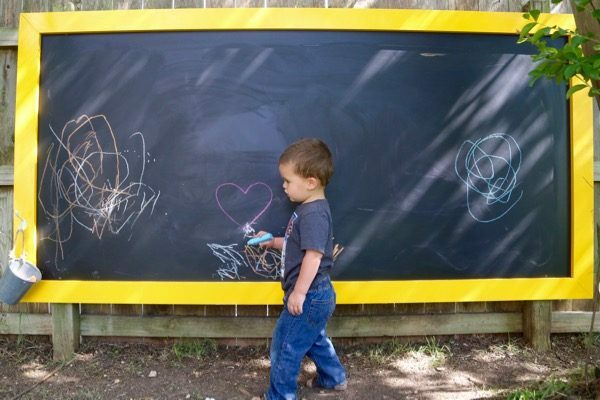 My daughter is obsessed with chalk right now and she would absolutely LOVE this! Oh my gosh! This is so fun! It’s just me and my husband and we would have a blast with something like this 🙂 Visiting from Merry Monday. Pinning! Thanks, Angie! It really is fun to have! Love this idea for my family even though my youngest is in 3rd grade. 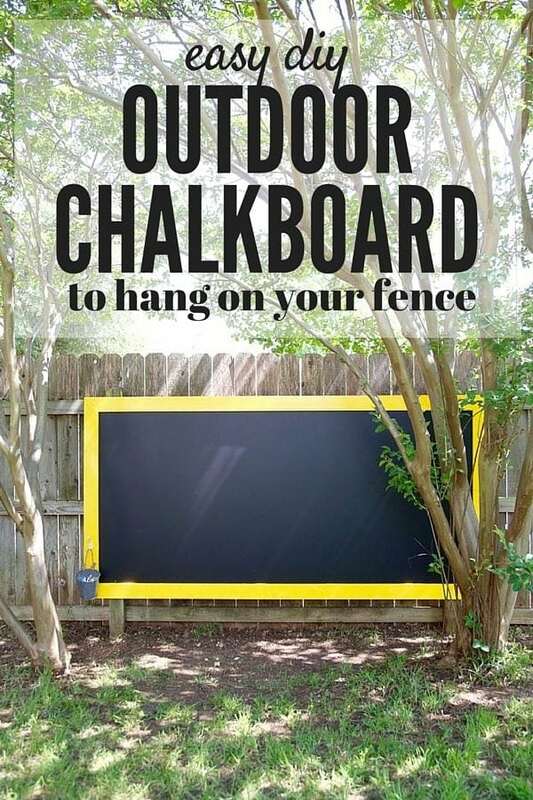 I have an oversized deck and am thinking of hanging this on my brick wall for family games such as Pictionary, hangman, etc… Super cute and fun idea for hosting a get together…. That’s an awesome idea, Candee! This is such a fun idea and I totally want to try it!!!! Wondering how it’s held up in the rain? So far, so good! We’ve had some pretty incredible amounts of rain over the last month or so and it’s still as good as new! Love it, what a brilliant idea ! I LOVE this! What an awesome thing to have outside for kiddos! Thanks, Clarissa! We’re loving it so far, too!